Members of the Brotogeris family are smart, curious, energetic and loved for their innate playfulness. These personality traits make them excellent pets. Handfed babies, in particular, have very sweet personalities. It is easiest to gain their trust and affection if introduced into the family as hand-fed and properly socially babies; however, with a little time and patience, "second-hand" birds can in most cases also be turned into loving and treasured pets. The most well-known and popular Brotogeris member is the Grey-cheek Parakeet - however, this species is not reproducing well in captivity and is increasingly difficult to find. Therefore, many take a look at the other brotogeris species as they share many of the same personality traits. Both males and females look alike - so if owners want to know the gender of their pet, DNA or surgical sexing is recommended. 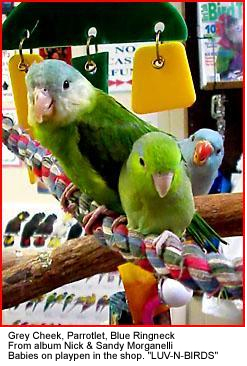 These active parakeets love to play and should be given lots of different kinds of Bird Toys / Entertainment to prevent boredom. They entertain themselves for hours with their toys. With time and patience, these smart little parakeets can easily be taught tricks. They are very energetic and in the wild enjoy climbing around in the trees - so they should be provided several different size perches to climb on. The perches should be of various types and diameters. Some should be small enough that they can wrap their feet around them while others should be wide enough for them to perch on them with their feet flat. They particularly enjoy braided, fabric, rope perches. These loyal little parakeets enjoy riding on their owners shoulders or climbing into, and snuggling up, in their owner's shirt pockets - which explains their nickname: "Pocket Parrot." As a general rule, these cuddly birds like to crawl under or into something that gives them a sense of security and privacy - which could be anything they can climb into, such as climbing into bags or boxes, crawling under cushions and blankets. At night, these parakeets also like to snuggle up in something cozy in their cage -- so do provide either a suitable hanging bed or snuggle hut (as available in bird / pet stores) for them to sleep in. This will also help them keep cozy when things are a little chilly outside. They challenge larger parrots and even other, larger pets, such as dogs, which can result in them getting attacked and bitten. They also sustain injuries from their climbing, jumping and wandering tendencies. They like to burrow in tight places, which puts them at risk of being smothered by their owners as they like to snuggle up close to them and owners unwittingly roll over or sit on them. Other reported accidents included them being stepped on (especially if their wings are clipped), flying into ceiling fans, hot burners, open pans of hot grease or boiling water, or drowning in open toilets. They can be stubborn and demanding. They will figure out a way to get what they want. Some will even throw temper tantrums when they don't get their way or are cranky when they are overly tired. Sometimes, it's not unlike having a toddler around. They are also very adventurous, bold, fearless and inquisitive - which can be a dangerous combination. They will challenge other pets much larger than themselves, including larger birds, cats and even dogs. Talking / Vocalization: Even though they are great mimickers and they able to learn human speech - their speech does not have the clarity of say the African Grey or Amazon Parrots. They can often be overheard mumbling to themselves. Even though they are not as noisy as their larger cousins - the macaws, amazons, cockatoos or conures - they can become loud when excited or if they are trying to get their owner's attention. Their chattering may also get loud at times and can be annoying to sensitive ears. Chewing: While they are not strong chewers they do enjoy destroying wood items. Providing plenty of chew toys and oversight will help prevent valuable things from being destroyed. Undisciplined parrots may chew on electric wiring potentially resulting in house fires. This, however, is far less likely to occur with a brotogeris species - as their little beaks would have to work really hard to chew through wiring. This being said, given sufficient time and lack of supervision, they can do some damage. For this reason, it is best to hide electric wiring or to cover them up with plastic tubing (available at Home Depot and other hardware stores). As a general rule, these parakeets regard anything in your home as a "toy" that can be explored and chewed on; destroying items that you may hold dear or are simply valuable - so providing plenty of bird toys to take their minds (and beaks) off your valuables is recommended. Biting: They do discover their beaks as method of "disciplining us" once they are out of the "baby stage" and they can generally be somewhat naughty, and it really is important to learn to understand them and to guide their behavior before undesirable behavior patterns have been established. Training is important to make sure that they don't develop any bad habits, be it screaming or biting. Even a young bird that has not been neglected and abused requires proper guidance; this becomes even more challenging when it involves a rescued bird that may require rehabilitation. I put together web resources for you to help you understand your pet bird and properly direct him. Please visit the following website to learn more about parrot behavior and training. Broto, Pocket Parrot, BeeBee Parrot, Tovi Parakeet - these are but a few of the names given to the charming family of birds otherwise known as Brotogeris Parakeets or Brotos for short. 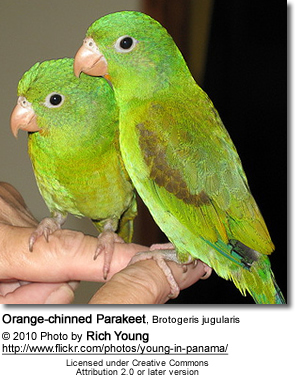 Brotogeris parakeets make excellent companion birds. They are intelligent and curious, playful and clownish, affectionate and charming. Smaller than a Cockatiel, they are about 7-9" from head to tail, with predominantly green feathers. Depending on the species, they also have varying markings of yellow, white, blue, orange, and grey on their wings and head. The most commonly recognized member of the Brotogeris genus are the Grey-cheeked parakeets. Grey-cheeked parakeets have been the most common of the Broto species kept as pets. They were imported by the thousands until the late 1980's. Because they were so plentiful and inexpensive, very few were set up to breed. As serious Broto breeders have discovered in the past 5-10 years, Grey-cheeks are inconsistent and problematic breeders, and very few young are being produced - not nearly enough to replace the older imported birds who are now dying at an increasing rate. Sadly, owners who were devoted to their now-deceased Grey-cheeks are finding it difficult, if not impossible, to find another one. Many of these former grey-cheek owners are now discovering the similarly charming and intelligent Canary-winged parakeet, another of the Brotogeris species. Canary-winged parakeets are similar in size to grey-cheeks, and share the same endearing qualities. Their feathers are a lighter and brighter lime green, with yellow wing feathers as their species-specific identifier. Another unique identifier Canary-wings possess are big, bright eyes. Canary-winged parakeets make wonderful pets, and some think that many individuals are better talkers and have a more analytical aspect to their intelligence than the Grey-cheeks. At Shady Pines Aviary we have had great success breeding Canary-winged parakeets, and many are available each spring. Other Brotogeris species whose numbers are now slowly increasing, but who are not yet plentiful in American aviculture, are the orange-chinned parakeet, white-winged parakeet, golden-winged parakeet, and cobalt-winged parakeet. We are fortunate to have bred each of these species in 2005. The remaining two Brotogeris species, the Tui parakeet and the plain parakeet, are practically non-existent in this country.